Mandalorians are known throughout the galaxy as ferocious warriors, and the sight of their iconic armour enough to strike fear in even the most hardened Imperial or Rebel. When it comes to space combat, the pilots of Mandalore prefer one star fighter above all others: the Fang Fighter. 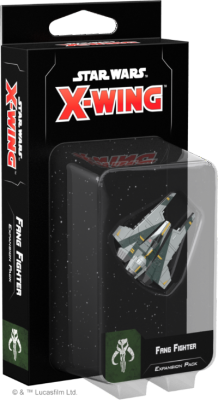 The Fang Fighter Expansion Pack includes a fully pre-painted Fang Fighter miniature, a manoeuvre dial, and all the ship cards, upgrade cards, and tokens you need to add one of these deadly starfighters to your squadron. In addition, the Fang Fighter Expansion Pack contains a few entirely new cards that have never before appeared in the game's first edition. These new cards and associated punch board are included in the Scum and Villainy Conversion Kit for the benefit of veteran players! Due in Monday 17th, subject to change depending on supplier shipping date.